So, you want to work out, but you don’t have weights on hand for a resistance training session? Don’t worry…hope is not lost! Instead of abandoning your workout, try one (or more!) 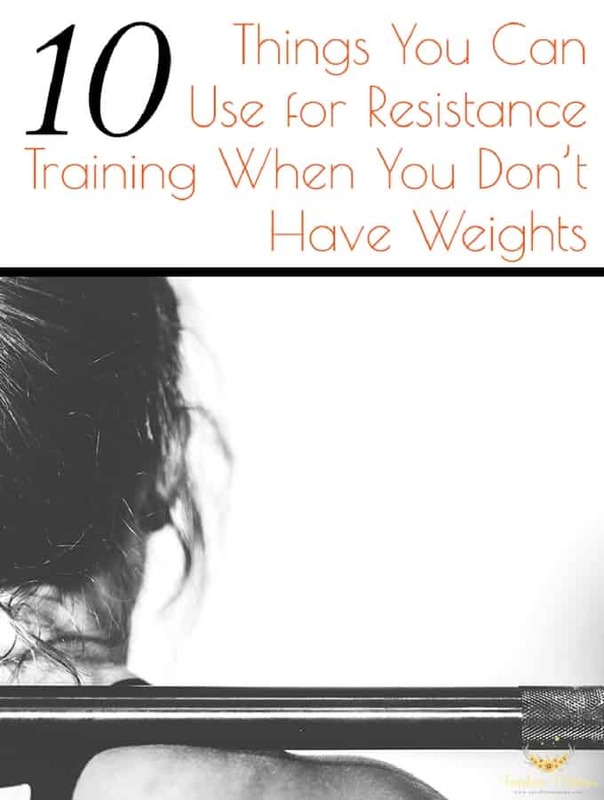 of these 10 things you can use for resistance training when you don’t have weights below. They’re perfect in a pinch and some of them can be used long term. Don’t let a lack of dumbbells keep you from achieving your fitness goals. Forget about added weight, your body weight is all you need for exercises like planks, burpees, push-ups, calf raises, and more. Choose exercises that focus on engaging your core to get a workout that will leave you sweating and burning calories in no time. You will be surprised with how much you can change your body through exercise with using nothing but body weight! Looping a towel across the balls of your feet and holding it taut can provide great resistance when doing exercises like leg presses or seated rows. Towels are also helpful when doing stretches before and after your workout. 16 oz. cans of vegetables or pasta sauce make excellent one pound weights. Make sure that the cans you select are narrow enough that you can get a firm grip on them. A can that’s too wide can be difficult to hold onto and can increase your risk of injury. Fill a jug with water for a gallon-size workout. These handy plastic containers can be used again and again to increase resistance in your training. Opt for exercises like upright rows vs. overhead exercises where it can be challenging to perform them safely. As an added safety tip, choose jugs with screw on tops vs. snap on lids, as the screw on tops are more secure and decrease your risk of being doused by water mid-workout. Fitness or exercise bands are a fabulous alternative to conventional dumbbells. They come in various resistance levels and can be easily transported. If you find yourself traveling quite a bit, a mid-range resistance band is a sound investment to tuck inside your suitcase for hotel room workouts. Have little ones at home? 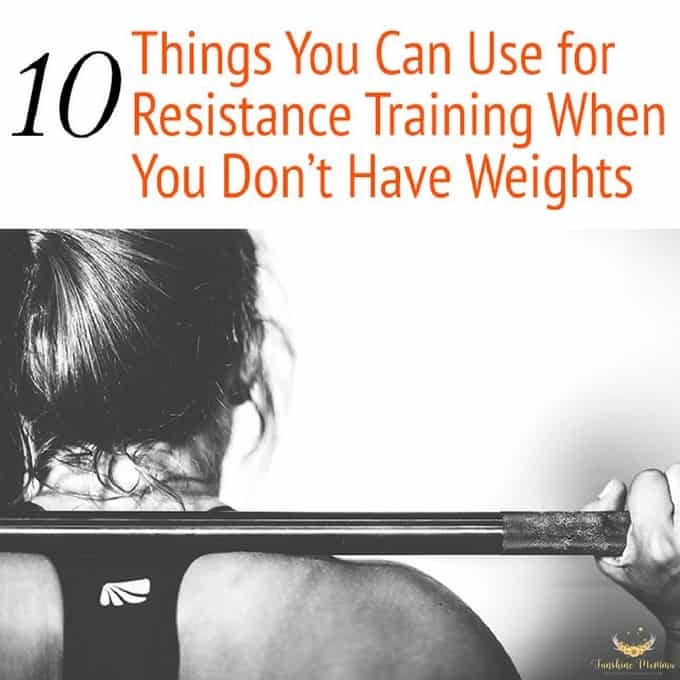 Use them during your workouts to add a bit more resistance. A seated leg raise becomes a lot harder with a toddler sitting on your foot and bicep curls take on a new level of resistance when you’re lifting a giggling three year old. Be sure your child’s safety always comes first when they’re helping you with your workout. A five pound bag of flour or sugar can give your workout the extra resistance you’re after. Before using them, be sure to enclose them in a sealed bag. Double bagging helps keep them fresh and ready for baking, while also ensuring that you’re not going to become a floured or sugary mess by the time your workout is over! For some serious weight lifting, take a cue from your feline friends and use a clean pail of cat litter. At up to 40 pounds per container, they can provide excellent resistance for weighted sumo squats, upright rows, and more. For a safer workout, choose the smaller, plastic jugs that many cat litter brands now come in. If you choose to use the larger pails, be aware that the handles can sometimes break off, so choose a wide stance exercise and wear protective footwear. Planning on building a sandbox for your kids this year? Or maybe you just have a sandbag in your garage? Put it to use by using it for resistance exercises. A 10 pound sandbag is perfect for a great, basic workout. Want to get a great total body workout without dumbbells? Use a large tire instead! From pulling the tire with a weight belt to flipping it around your yard, this giant resistance tool can give you a workout you won’t soon forget. Don’t let a lack of traditional weights stand in the way of your fitness goals. With some creative thinking and a no-excuses attitude, you’ll be celebrating your resistance workout in no time. As always, choose safety first and consult your doctor before beginning any exercise program.